Manuel Lanzarote also scored in the Gaurs' success. 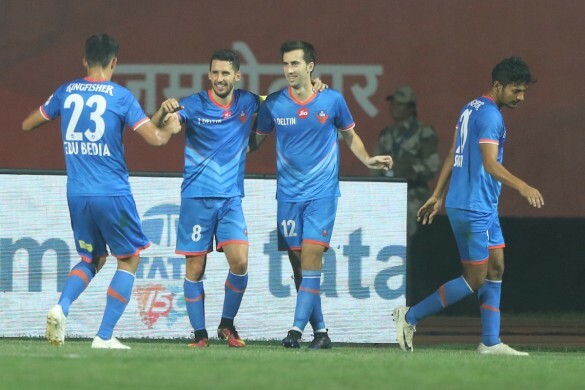 It was a tale of two red cards and a brace from Ferran Corominas as FC Goa cruised into the Hero Indian Super League semi-finals with a convincing 3-0 win over Jamshedpur FC at the JRD Tata Sports Complex, Jamshedpur, on Sunday. Goa needed at least a draw to seal their spot in the final four, but a win takes them to third in the table, one place above FC Pune City. Jamshedpur fought valiantly but are now out of the reckoning and will look forward to the Super Cup after finishing fifth. Jamshedpur had no option but to chase the match and that left big gaps at the back. Lanzarote's aerial through ball found Corominas on the run, and he slammed it past the goalkeeper after excellent technique to control the ball. With a two-goal cushion, the visitors started attacking with all their force to finish the match off. Ahmed Jahouh took a rasping effort from distance which struck the woodwork, but Goa soon found the third goal. Things got interesting when Goa lost their goalkeeper Naveen Kumar for exactly the same reason Jamshedpur did - but this comedy of errors came too late for Jamshedpur to make the most of it. Goa had already scampered away to a healthy lead and stormed into the semi-finals where they will face Chennaiyin FC.